NEW DELHI: Prime Minister Narendra Modi today invoked the life and struggle of RSS ideologue Eknath Ranade to urge the youth to make their life meaningful rather than be just successful and cited the example of Bill Gates to bring home the point. Saluting the contributions of Ranade who lived by the teachings of Swami Vivekananda, the Prime Minister hoped that Ranade's ideals of "one life, one mission" will inspire the youths to join in nation-building and fulfil Swamiji's dreams. "Ask anyone what the purpose of their life is and they will tell you it is to be successful. But Ranade used to attach more importance to make life meaningful rather than being simply successful. That should be our strive in life," he said. 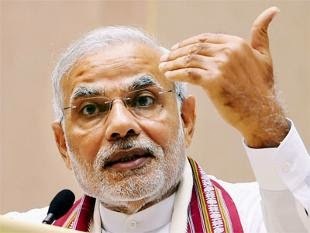 To drive home the difference between a "successful (safal)" and a "meaningful (sarthak)" life, the Prime Minister cited the example of Microsoft founder Bill Gates, one of the richest men in the world, is today working towards social welfare, helping people install toilets across the world and serving humanity. "Bill Gates made a discovery that changed the world. He made a world of wealth, attained unmatched success but then realised that all this was not the end of life. He then donated money towards the human development in poorer nations, supporting toilet-building and other activities. This made his life meaningful," he said. Modi said Ranade's vision should inspire in creation of an India that is both "bhavya" (prosperous) and "divya" (spiritual). Modi, who at a function at Vigyan Bhawan launched the birth centenary celebrations of Ranade that will begin from November 19, recalled how as a youngster he had the chance of being blessed by the RSS ideologue. The Prime Minister said Ranade played a "very significant role during the Emergency".